Early in the 20th century the Permian, along with the Pennsylvanian and Mississippian, were considered epochs of the Carboniferous Period (Wilmarth, 1925). Of some note is the statement by Wilmarth (1925, p. 73) relative to the lower boundary of the Permian, "The division line between the Permian and Pennsylvanian in the United States is in general a purely paleontological boundary." It is interesting to compare this to the following from Mudge and Yochelson (1962, p. 127), "As there is no clear agreement as to what constitutes the Permian, especially in regard to definition on the basis of fossils, any boundary established in Kansas must be regarded as tentative and subject to change when more is known of the type area in Russia. . ." and concerning the lower boundary at that time "There is apparently no faunal evidence for placing the systemic boundary at the top of the Brownville Limestone Member of the Wood Siding Formation, but since this boundary is commonly accepted by workers in the midcontinent, . . . it may as well continue as the boundary." It is because of the conformability of this boundary that its accurate recognition has required the careful and detailed biostratigraphic studies noted below. The boundary remained at the top of the Brownville limestone until Baars, Ross, et al. (1994) and Baars, Ritter, et al. (1994) proposed moving it to the base of the Neva Limestone, a lithostratigraphic member that they elevated to the status of a formation to ". . . simplify lithostratigraphic terminology and to begin the redefined Permian System and Council Grove Group with a sequence boundary" (Baars, Ritter, et al., 1994, p. 15). The primary basis for this change was the first occurrence of the Pseudoschwagerina fusulinid biozone in the Neva. In this they agreed with the accepted understanding as expressed by Moore (1940), who suggested that the base of the Pseudoschwagerina fusulinid biozone should be the base of the Permian. Additionally, Baars, Ross, et al. (1994) and Baars, Ritter, et al. (1994) indicated 1) that the upper boundary of the Admire Group is at the top of the Grenola Limestone, and 2) that the entire Admire Group is the uppermost group of the Upper Carboniferous (Pennsylvanian) in Kansas. Although Ritter (1995) published the detailed conodont biostratigraphy of the Carboniferous-Permian interval, he retained the boundary between the two as published by Zeller (1968). However, comparison of the base of the Permian stratotype in the Ural Mountains of Russia (the International Commission on Stratigraphy now officially recognizes this biostratigraphic boundary as the Carboniferous-Permian boundary) with the sequence in Kansas, in terms of the ammonoids, fusulinids, and conodonts (Davydov et al., 1995; Ritter, 1995; Chernykh et al. 1997; Boardman et al., 2009), has resulted in international agreement that the base of the Permian in Kansas occurs within the Red Eagle Limestone formation at the base of the Bennett Shale Member (Boardman et al., 1998). This is lower, stratigraphically, than the boundary in the Neva Limestone Member proposed by Baars, Ross, et al. (1994) and Baars, Ritter, et al. (1994). The base of the Permian System in Kansas, a horizon based on detailed and careful biostratigraphic studies, is at the base of the Bennett Shale Member of the Red Eagle Limestone (Sawin et al., 2006) (figs. 2, 3, 4A, 4B). This is also the base of the Asselian Stage/Age (Boardman et al., 1998, Sawin et al., 2006, 2008) . Concerning this boundary Boardman et al. (1998, p. 19) stated ". . . the Carboniferous-Permian in the southern Urals can be confidently correlated to the base of the Bennett Shale Member of the Red Eagle Limestone." The fact that this boundary occurs within a lithostratigraphic unit, that is, a formation, is irrelevant because such systemic boundaries are by definition biostratigraphic, not lithostratigraphic. Correlation of this biostratigraphic sequence in Kansas with the type area in Russia demonstrates the importance and uniqueness of the upper Paleozoic rocks in the state. Figure 2--Stratigraphic succession of Permian rocks in Kansas (Sawin et al., 2008). 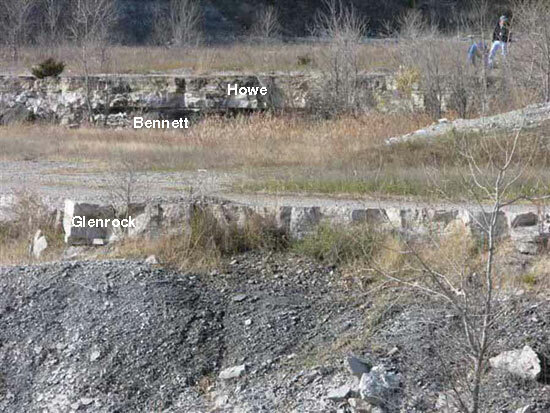 Figure 3--Exposure of the Red Eagle Limestone in an eroded area below Tuttle Creek Lake Spillway; near center N/2 sec. 19, T. 9 S., R. 8 E., Pottawatomie County, Kansas. 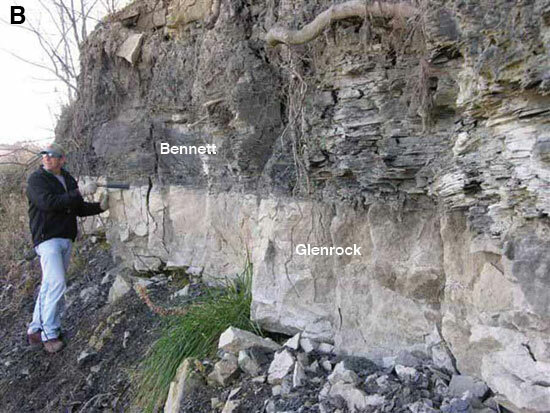 Figures 4A and B--Exposure of the Red Eagle Limestone in an eroded area below Tuttle Creek Lake Spillway; the base of the Bennett shale is the boundary between the Carboniferous-Permian; near center of N/2 sec. 19, T. 9 S., R. 8 E., Pottawatomie County, Kansas. Not only was there disagreement over who first recognized the Permian in Kansas, there were, and still are, different opinions as to what should be included as Permian, even though the uppermost Permian (Ochoan) is probably missing in Kansas (Sawin et al., 2008). Initially, the red beds of the upper Permian in Kansas (Salt Fork, now the Salt Plain Formation, and above) were frequently correlated with the Dakota Formation and considered Cretaceous (Prosser, 1905, p. 145). Subsequently they were questionably assigned to the Triassic and then the Jurassic-Triassic. It was not until 1893 that they were correlated with red beds in Texas and considered Permian (Hay, 1893; Prosser, 1897, 1905). McLaughlin (1942) and MacLachlan (1972) reported rocks of the Dockum Group (Upper Triassic) in southwestern Kansas, but this age cannot be confirmed because this isolated exposure is unfossiliferous. These rocks are currently considered to be Jurassic (Zeller (1968, p. 53). Triassic rocks are reported from the subsurface in Kansas, but until there is more direct evidence supporting a Triassic age for these rocks where they crop out, they cannot be considered Triassic. Thus, it is geologically prudent to recognize the contact between the Paleozoic (Permian) and Mesozoic (mostly Cretaceous) as the erosional unconformity that separates the Permian red beds from the overlying lighter-colored sandstones, siltstones, and mudrocks of the Cretaceous (fig. 5). 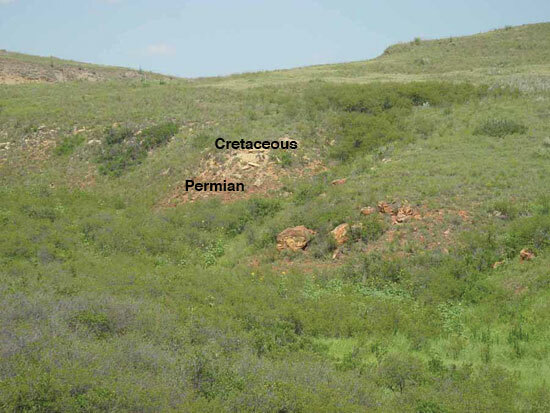 Figure 5--Exposure of the Cretaceous-Permian contact; light-colored Cretaceous above red Permian strata crop out along the east side of the road going south from Clark State Fishing Lake; near center of W/2 sec. 18, T. 32 S., R. 22 W., Clark County, Kansas. The distribution of Permian rocks in Kansas at the surface and in the subsurface is shown in fig. 6. An isopach map of the Permian evaporite deposits in Kansas (fig. 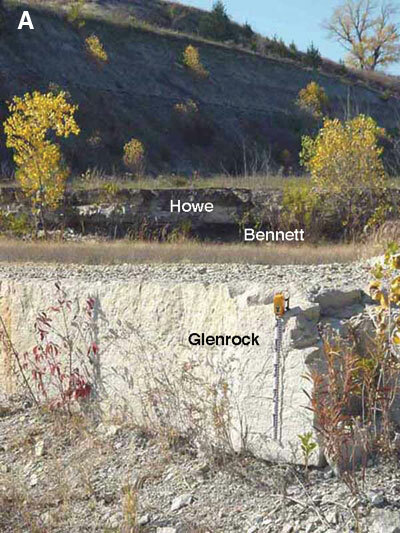 7) shows that the maximum thickness of these deposits is about 1,400 ft (427 m) in Clark County. Additional maps of the Permian rocks in Kansas, showing lithofacies and, in some cases, inferred depositional environments, can be found in Mudge (1967) and McKee and Oriel (1967). Figure 6--Distribution (surface and subsurface) of Permian rocks in Kansas (modified from Merriam, 1963, fig. 32, p. 80). Figure 7--Isopach map of the Permian evaporite deposits in Kansas (modified from Merriam, 1963, fig. 35, p. 84). Generalized [east-west (fig. 8) and northwest-southeast (fig. 9)] stratigraphic cross sections show the general thickening of the Permian in the west-central part of the state and a conspicuous thickening from the northwest (Cheyenne County) to the southeast (Edwards County). Most of this thickening occurs in the Leonardian and Guadalupian Series, i.e., the red-bed and evaporitic intervals of the Permian. This also is clearly shown by the isopach map mentioned above (fig. 7). Associated thicknesses of halite-bearing strata in the Leonardian Hutchinson Salt Member range from zero (surrounding a marine embayment in western Kansas) to over 500 ft (153 m) along the Kansas-Oklahoma border (near the center of the embayment) in Meade County (Watney et al., 1988). This embayment is connected to the Permian seaway in West Texas (Johnson and Denison, 1973). Figure 8--Generalized stratigraphic (electric log) cross section of the Permian rocks in Kansas from east (Dickinson County) to west (Cheyenne County) (modified from Merriam, 1963, fig. 33, p. 82-83). Figure 9--Generalized stratigraphic (electric log) cross section of the Permian rocks in Kansas from southeast (Edwards County) to northwest (Cheyenne County) (modified from Merriam, 1963, fig. 34). Essentially continuous deposition from the upper Carboniferous (Pennsylvanian) into the lower Permian in Kansas is shown by McKee and Oriel (1967, plate 2) and is well illustrated by the difficulty associated with the recognition of the boundary between these two late Paleozoic systems. Major structural features during the deposition of Permian rocks in Kansas are, as given by McKee and Oriel (1967, fig. 3), the northern part of the Midcontinent Negative Belt and the Nemaha anticline. West of the Nemaha anticline within the northern part of the Midcontinent Negative Belt are a number of smaller positive and negative features as shown by Mudge (1967, fig. 41). The more prominent of these are the Salina basin, Sedgwick basin, Kansas Permian basin, Hugoton embayment, Los Animas arch, and Central Kansas uplift. The eastern edge of the Permian outcrop is 20-30 mi (32-48 km) east of the Nemaha anticline. According to Maher (1945), westward tilting of strata in eastern Colorado occurred during the upper Permian and resulted in truncation of the lower Permian units prior to Mesozoic deposition. By association, one can assume that the Permian strata in Kansas were similarly affected. Mudge (1967, p. 123, fig. 43) indicated the inferred drainage during the Mesozoic and Cenozoic that eroded Permian strata in Kansas. Triassic drainage was toward the west and southwest indicating erosion of exposed Permian strata to the east. Although erosion was prevalent during the Lower and Middle Triassic, Upper Triassic sandstones of the Dockum Group were deposited in some areas (Mudge, 1967, p. 122) and are recognized in the subsurface of southwestern Kansas (MacLachlan, 1972, p. 172, fig. 6). Post-Triassic and pre-Jurassic erosion occurred following further uplift that beveled much of the Permian strata in northwestern and western Kansas (Mudge, 1967, p. 122). It seems reasonable to suggest that Upper Triassic rocks might have originally covered a much larger area. The same might also be suggested for the Jurassic, which is present over a relatively large part of the subsurface of northwestern Kansas (Mudge, 1967, p. 121, fig. 42). Merriam (1955) suggested that these Jurassic strata are fluvial and lacustrine in origin and are associated with a southeast to northwest drainage system. Rocks of Cretaceous age overlie the Permian in a broad belt extending across Kansas from the southwest (Grant, Haskell, Meade, and Clark counties) to the northeast (Jewell, Republic, and Washington counties). Along the boundary with Oklahoma in the southwestern part of the state, Neogene rocks overlie the Permian (Mudge, 1967, p. 121, fig. 42). Drainage from the Cretaceous through the Neogene was, and still is, aligned in an east to northeast direction (Mudge, 1967, p. 122). During most of the Permian, Kansas was a broad shallow-marine shelf that sloped southward toward the Anadarko basin. In current terminology it is more appropriately a ramp, with a large landmass to the east and north that provided most of the terrigenous sediment to the over 3,500 ft (1,068 m) of Permian rocks that accumulated (Mudge, 1967, p. 118, fig. 40). As shown by Ziegler et al. (1997), Kansas was located within the northern tropical latitudes during the Permian with a tropical to dry subtropical climate (Ziegler et al., 1998). According to Kent and Muttoni (2003, fig 3.4), Kansas was in a tropical climatic belt during the lower Permian where precipitation exceeded evaporation; however, by the Middle Jurassic, evaporation exceeded precipitation in Kansas. Hypersaline conditions seem to have become more extensive from lower to upper Permian. Beds of evaporites in the upper part of the lower Permian (Wolfcampian) and extensive evaporites (halite and anhydrite) in the upper Permian (Leonardian and Guadalupian) suggest extensive evaporation of seawater, or at least excess evaporation over precipitation, runoff, and ground-water recharge. As suggested by Miller et al. (1996) for the Wolfcampian, the climate of this marginal-marine area probably fluctuated from arid to semiarid to seasonal wet/dry (monsoonal conditions). Later, during the Leonardian and Guadalupian, the lithologies, including eolian siliciclastics (Parrish and Peterson, 1988; Johnson, 1989; Soreghan, 1992; Ziegler et al., 1997; Ziegler et al., 1998; Mack et al., 2003), are consistent with a more arid to semiarid climate.